Former Booker winner Howard Jacobson is among the three British writers, two Americans and an Australian to make this year's shortlist. The other writers are Neel Mukherjee, Ali Smith, Joshua Ferris, Karen Joy Fowler and Richard Flanagan. It is the first year the prize has included US writers, having previously included those from the Commonwealth, Ireland and Zimbabwe. The winner of the £50,000 prize will be announced on 14 October. 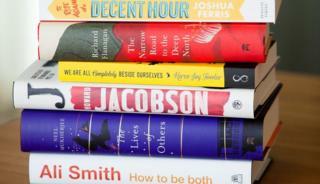 The shortlisted authors each receive £2,500 and a specially bound edition of their book. AC Grayling, the chair of the judges, said they "just chose the books which were the best", adding "there was no question of tokenism". "As the Man Booker Prize expands its borders, these six exceptional books take the reader on journeys around the world, between the UK, New York, Thailand, Italy, Calcutta and times past, present and future," he said. Judge Sarah Churchwell said the books carried modern themes, adding: "These novels are very engaged with the contemporary world. "It is striking when we look at the books selected in the recent past how strong historical fiction was. Although we got many wonderful historical novels we felt with these six, that there were some very interesting books here about the 20th and 21st Century." She later added that Smith's novel does feature the Renaissance era, but from a modern perspective. Previous winners of the prize have included Hilary Mantel, whose 2012 winner Bringing up the Bodies, was about Thomas Cromwell, an adviser to King Henry VIII, and charted the bloody downfall of Anne Boleyn. It was the sequel to Wolf Hall, which won the prize in 2009. The judges say they were interested only in the quality of the writing, but in the end they have come up with a shortlist that ticks all the boxes. Neat and tidy, some might even say rather safe. Two women make the final six. And fears the prize would be swamped by American writers have proved unfounded. Only two authors from the United States make the final list. Joshua Ferris, whose book was dubbed "The Catch-22 of dentistry" by Stephen King and Karen Joy Fowler's family saga which has already won the 2014 PEN/Faulkner Award for Fiction. In recent years historical fiction has dominated the prize, so it is notable that this year the books are set in the future, present or recent past. Art, war and the internet emerge as key subjects. But traditional themes are still at the forefront: love and grief, ambition and desire and the strangeness of the ordinary. The judges said it was "really difficult" to come up with the shortlist. They say that every year. But it did take them three hours and 40 minutes to reach a decision, which is longer than usual. I suspect some books passed smoothly from longlist to shortlist, but others were argued over far more vociferously. Jacobson, who won in 2010, is nominated for his futuristic love story J. It features two main characters who inhabit a world where the past is not spoken about and is shrouded in suspicion, referred to as "What Happened, If It Happened". His previous win was for his comic novel The Finkler Question, beating contenders including double winner Peter Carey. Ferris's third novel, To Rise Again at a Decent Hour, looks at atheism through the eyes of a dentist, who spends the day looking at death and decay but cannot find solace in religion. Australia's Flanagan was the only non-British representative of the Commonwealth on the longlist. He is nominated for The Narrow Road to the Deep North, a haunting account of the Australian servicemen who, as Japanese prisoners of war, were forced to build the so-called Burma railway. The author wrote the book in tribute to his late father who survived the experience - but thousands more did not. Considered by many to be the finest Australian novelist of his generation, his other works include The Sound of One Hand Clapping and he also co-wrote the script for the Baz Luhrmann film, Australia. Fowler, who is best known for her light-hearted novel The Jane Austen Book Club, is nominated for We Are All Completely Beside Ourselves, about an ordinary Mid-western family: two parents and three children - one of whom turns out to be surprisingly special. Mukherjee's The Lives of Others begins in Calcutta in 1967, and reveals the stark contrast between the lives of two Bengali families - one wealthy and the other in poverty. The political activism of the era provides a backdrop to his portrayal of the chaos of family life. Smith was one of only three women on the 13-strong longlist for her inventive new novel, How To Be Both. She has been shortlisted twice before, with 2005's The Accidental and Hotel World in 2001. Her book, How to be Both, tells two interlinking stories, one about a renaissance artist in 15th Century Italy, the other about a child of the 1960s - and the reader can decide which half to read first. This year marks the 46th year of the prize. Grayling's fellow judges are Churchwell, Jonathan Bate, Daniel Glaser, Alastair Niven and Erica Wagner. Their task now is to re-read the six novels in order to choose the winner. So far the betting odds are being led by the British writers. Ladbrokes has Mukherjee in the lead with 2/1, followed by Smith on at 3/1, Jacobson at 4/1, Flanagan at 5/1, Fowler at 6/1 and Ferris on at 12/1. William Hill has Howard Jacobson and Ali Smith both leading with way at 3/1, followed by Mukherjee at 4/1, Joshua Ferris at 5/1 and Flanagan at 6/1. Last year, the Booker was won by New Zealand's Eleanor Catton for The Luminaries. At 28, she was the youngest-ever winner and said her life had been changed by the award. "I've been given opportunities to travel and to see my book read by such an astonishingly wide readership all over the world," she said. This year's ceremony will be broadcast by the BBC.